Are your chickens talking about you? On spring days, when normal people are listening to NPR or CDs or music on their smartphones, I listen to the baby monitor. We don’t have a baby. I got the device to eavesdrop on our chickens’ conversations. I bought it to listen for distress calls. Being a chicken in rural New Hampshire is risky business, due to foxes, coyotes, dogs, hawks, and a host of other predators. Our flock well knows this, and if anyone sees a predator, they call out to warn the others — and thanks to the baby monitor, their calls also summon me to the rescue. They don’t yell out “predator.” Their calls are quite specific. Alarm calls not only announce the species of predator spotted, but also its speed, size, and direction. At Macquarie University in Australia, psychology professor Chris Evans and his colleague and wife, Linda, identified nearly 30 phrases the birds use to convey information to others in the flock. For instance, roosters enticing hens to tell them when the food is especially tasty. The Evanses showed that a rooster calls at a faster rate when alerting his flock to their favorite — corn — than when he is merely pointing out the discovery of their regular feed ration. But food and predators aren’t all that chickens talk about. They may also be talking about us. Her flock has invented a name for her. It sounds like: Ba-BA-Ba-BAAAA! This is not the first time observers have documented animals using particular sounds to refer to approaching people. Arizona professor Con Slobodchikoff has documented that prairie dogs — gregarious ground squirrels —use specific sounds to communicate to others that a human has been spotted. (They also discuss the dangers of cats, badgers, hawks, and ferrets, as well as announce the comforting presence of harmless species like cows and pronghorns, who signal safety.) Not only that, but the little mammals can communicate what color shirt the human is wearing, whether he is tall or short, and even whether the human is carrying a gun! That’s different from endowing any specific individual with an actual name — like “Sue,” or for that matter, “ba-Ba-BA-BAA!” But other animals are known to use individual names. Scottish researchers at the University of St. Andrews announced in 2000 that dolphins have names for one another, which they refer to as “signature whistles.” Further studies, on wild dolphins in South Africa and in Florida, as well as experiments with captive animals, has proved not only that dolphins invent names for themselves and others, but that they will call out the names of loved ones when they are separated, just like you call your kids or friends when you are looking for them. Big-brained mammals like dolphins aren’t the only ones to use names. In 2008, scientist Karl Berg discovered that wild parrots do, too. Green-rumped parrotlets of Venezuela use specific peeps to identify themselves and others. They can, in effect, call out to other parrots: “Hey, Jill, it’s Tom! Wanna go get some fruit?” Furthermore, Berg showed how the parrotlets get their names: like us, their parents name them. That parrots have names in the wild shouldn’t be too much of a surprise. Parrots easily learn our language; why shouldn’t they have their own? Everyone knows how smart dolphins are. As for prairie dogs, at least they’re mammals like us. But chickens? Too many people dismiss them as stupid. At Melissa Caughey’s coop in Osterville, her flock has invented a name for her. It sounds like: Ba-BA-Ba-BAAAA! That’s a big mistake. 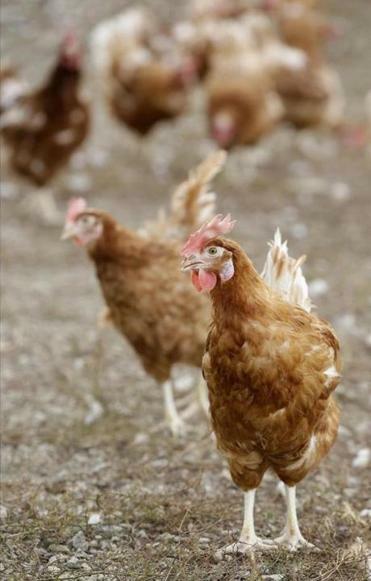 Chickens — like most animals — are much smarter than we give them credit for. Scientific experiments show they easily recognize the faces of at least 100 individual chickens; remember the past and anticipate the future; and have excellent spatial memories. Caughey suggests that my flock may have a name for me, too, and that our hens probably have names for each other as well as for their humans. We wonder what other species do this: elephants, wolves, crows? What about fish? In coming years, we predict, we’re likely to hear similar discoveries about these animals, too. As for me, I’m staying tuned to the baby monitor. I’ll let you know what I find out. Sy Montgomery is the author of 20 books on animals for adults and children. Send your questions on animals to syandlizletters@gmail.com; keep up with Melissa’s flock at her blog.